Many people flee their home countries in search of freedom. It is no surprise that the United States of America has become one of the top choices for refugees applying for asylum from their oppressive governments. However, before you can become an asylee in the U.S., you need to formally seek asylum status based on one of the five factors: race, religion, nationality, political opinion, or membership in a particular social group. Attorney Ismail Shahtakhtinski and his team have extensive of experience in providing legal assistance to asylum seekers from all over the world. The key to your asylum approval is to establish a well-founded fear of persecution in your home country. You must convince the asylum officer or the immigration judge that you have suffered persecution in your home country before. You must demonstrate that the conditions that caused that persecution have not changed, or that there is a reasonable chance of persecution in future if you return to your home country. You must also establish that there is no safe part of your country to which you can return and that you have not firmly resettled in any other country. There must be a reasonable possibility of persecution. The key to your case will be to prove and establish a well-founded fear of persecution in your home country. You will have to convince the asylum office or the immigration court that you have suffered persecution in your home country before, and the conditions have not changed, or that it is likely that you will be persecuted or will suffer if you return to your home country or both. Subjective factor. In the context of applying for asylum, fear is defined as awareness of danger. Thus, to satisfy the subjective element, you must show that your fear is genuine. An asylum seeker should only be motivated by a genuine fear of persecution while proving his or her case. A country’s poor economic conditions, civil unrest, or the presence of a natural disaster are not relevant considerations in an asylum application. Objective factor. You must prove the objective side of your case. For your fear to be acknowledged as well-founded, you must prove that there is a reasonable possibility that you would be persecuted in your home country. In other words, your fear must be objectively reasonable. You must be very clear while establishing well-founded fear. Your testimony may be enough to make your case, if it is a compelling, genuine, and consistent story. Definition: There is no universally accepted definition of “persecution”, but the Board of Immigration Appeals defines persecution as “infliction of harm or suffering by a government or persons a government is unwilling or unable to control, to overcome a characteristic of the victim.” Examples: Genocide; Slavery; Torture; Cruel or degrading, inhuman treatment; Threats of life; Arbitrary arrest or detention; Inability to earn a livelihood; Inability to travel safely within a country; Arbitrary interference with a person’s privacy; Serious restrictions on access to normally available education; Passport denial; Constant surveillance; Pressure to become an informant; Confiscation of property. * Past persecution: Past persecution provides presumption of well-founded fear. To show past persecution the applicant must prove that an incident: (1) Raises to the level of persecution; (2) Is on account of one of the five enumerated grounds (race, religion, nationality, membership in a particular social group, or political opinion); (3) Is committed by the government or forces the government is unable or unwilling to control. * Future persecution: Absence of past persecution is not a bar to asylum. The asylum seeker may also qualify for asylum by showing the reasonable possibility of future persecution. If you have applied for asylum, you may be able to obtain employment authorization and work in the United States. However, you can only apply for employment authorization 150 days after you submitted your asylum application, excluding any delays caused by you (such as a request to reschedule your interview or hearing), provided that no decision has been made on your application during that time. If you are granted asylum, you may work immediately. One year after the grant of asylum, you can apply for green-card by filing a petition to adjust your status to permanent resident of the United States. If your spouse and/or children have been granted derivative asylum based on your petition, they will have to submit their own applications to adjust status and register permanent residence (I-485). A green-card will make you eligible for all immigration benefits available to permanent residents of the United States, such as the ability to work legally, to apply for U.S. citizenship after you have held your green-card for five years, and to file immigrant visa petitions for your relatives abroad. Although the results of each specific asylum case may differ based on the asylum office and particular interviewing officer, it is important for all asylum applicants to carefully prepare for their asylum interviews. Attorney participation at the interview is very important. If an applicant is not sufficiently prepared for the interview, his or her application may be denied or transferred to immigration court. Applying for asylum through immigration court (defensive asylum application) is much more difficult than through the asylum office (affirmative asylum application). In immigration court, the respondent is just one step away from deportation order if his or her application for asylum is denied. Importantly, immigration court proceedings take years, whereas asylum offices usually schedule an interview within several months, and decide on the case within a few weeks after the asylum interview. 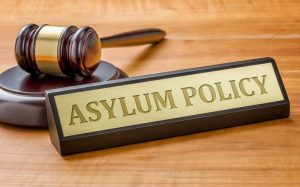 To be represented in immigration court by a lawyer, the asylum applicant has to pay additional attorney’s fees, which could have been avoided had the case been approved by asylum office. Often, asylum applicants in immigration court proceedings have to wait 4 or 5 years, especially if their process involves rescheduling court dates or appealing judge’s decisions. While your case is pending with an immigration court, your children may “age out” of eligibility to claim derivative asylum. For example, if you have an unmarried child who is 19 or 20 years old when you apply for asylum, such child is likely to still be under 21 by the time you get a decision from asylum office. If you are granted asylum, such child will be eligible to be a derivative beneficiary of your petition, meaning that he or she can receive asylee status based on your approved application. However, if your case is referred to immigration court, such child is almost certain to be over 21 by the time your case is decided. Therefore, even if you are eventually granted asylum, your child will be ineligible to claim derivative beneficiary status. Immigration courts are notorious for failing to properly calculate asylum seekers’ clocks, which determine their eligibility for work authorization. If you become a victim of such administrative error and your asylum clock does not start or restart when it should, you may end up waiting all these years unable to work legally. If you are eligible for employment authorization, the filing fee is waived for first-time asylum applicants, but after your employment authorization card expires in one year, you have to pay filing fee (currently $380) for each renewal. If your court proceedings take many years, you may have to spend thousands of dollars to be eligible to work during this time. The process in court is adversarial; during a hearing, there is a judge and an opposing side – a government attorney, also known as prosecutor – who is trying to disprove the applicant and find inconsistencies in the applicant’s story. In the asylum office, on the other hand, the process is non-adversarial; during an asylum interview, the interviewing officer simply asks questions, and the applicant answers. (1) The lawyer’s familiarity with the political and social conditions in the country of your origin – Some lawyers, although experienced in immigration laws, may not be sufficiently informed or educated about the client’s home country. As such, it may be difficult or even impossible for that lawyer to understand all intricacies of the social and political situation in the country of persecution. Lack of such understanding may severely limit the attorney’s ability to effectively represent the asylum client. (2) The lawyer’s interest, understanding, curiosity and appreciation of your culture and ethnic, social, political or religious background – A good asylum lawyer does not have to be of the same ethnicity, political opinion, religion or national origin as the applicant. It is also not important for a lawyer to readily know or share your political and social views, religion, or culture. What is important, however, is that your asylum lawyer must be interested, curious and eager to learn more about you and every aspect of your life that may have an effect on the chances of getting asylum in the US. (3) Individual attention and use of support staff – A good immigration lawyer must be able to utilize a professional support staff, while dedicating individual attention to each and every case. There should be no exceptions. If you did not meet your asylum case lawyer during your initial consultation, you should not hire such firm. If you will not have one single lawyer who will be fully dedicated to your case and handle your asylum case from day one to the end, your chances of favorable result are very slim. A good asylum lawyer must be personally on top of every development in your case. Your lawyer must regularly meet with you and everyone involved during every stage of the process, including the preparation of the applicant’s personal statement, drafting affidavits, witness preparations, identifying and providing supporting evidence, preparation for the interview, and most importantly the interview participation. We at I.S Law Firm, PLLC ensure that your asylum case is diligently prepared, timely filed and well presented to the asylum office or immigration court. Our lawyers meet with each client from day one and maintain constant contact throughout the process. Our team of professionals conducts thorough research to identify and present country condition reports and experts in support of our clients’ asylum cases. I.S. Law Firm has secured many asylum approvals from asylum offices and immigration courts all over the country. In some case, clients come to us after their affirmative asylum cases have been mishandled or denied. In such cases, we spend time to identify and address every issue which may have caused the denial and reorganize the file for the immigration court. By doing so, we have helped numerous applicants in the past to successfully obtain their asylum grants through immigration courts, even after their cases have been referred to courts by the asylum officers. Thoroughly preparing for your asylum interview is equally important as preparing and filing your asylum application. We spend one-on-one time with each asylum client to prepare for their asylum interviews and our asylum lawyer attends each interview in person. Over the many years of asylum practice, we built up a good reputation and rapport with immigration offices, immigrations courts and government agencies. We are closely familiar with the political atmosphere and human rights conditions in the countries from which our clients seek refuge. Therefore, we have high asylum approval rates. To see if you qualify for asylum, please contact us schedule a consultation. Can I travel to my country with green-card through marriage with US citizen after withdrawing my asylum application? If I applied for asylum and my case was pending. At that time, I married a US citizen and applied for a Green-card based on marriage, and the asylum application was withdrawn. When I am already the green-card holder, can I go to the country from which I previously applied for asylum? Answer: Depends. If you return to your country, from which you previously applied for asylum, you may be asked – how? Was your asylum application then frivolous? Or did the country conditions change? What changed? By virtue of applying for asylum, you stated to the US government that you were unable or unwilling to return to your country due to reasonable fear of harm. If you now return, the questions will be – what changed? Filing and withdrawing asylum application by itself raises a question of possible misrepresentation. But when you withdraw and then return to the same country, where you previously claimed that you would be harmed, you are almost certain to trigger these questions down the road; for example, when you apply for renewal of your green-card or citizenship. Will my immigration case be delayed by a government shutdown? Answer: It depends upon your type of case. If you applied for any immigration benefit with US Citizenship and Immigration Services, your case will not likely be affected by any government shutdown. That is because USCIS accepts fees for their applications, therefore, they are not affected by a lapse in funding due to a shutdown. Immigration and Customs Enforcement operations also proceed as normal during a shutdown. While affirmative asylum cases also continue being processed during the shutdown, the defensive asylum cases in immigration courts get delayed. In fact, all non-detained cases in Immigration Courts are suspended during the government shutdown. The majority of Immigration Courts hearings during government shutdowns, with the exception of detained removal proceedings. I am asylum applicant. Can I apply for Refugee Travel Document? Answer: You cannot apply for Refugee Travel Document if you are an asylum applicant and your asylum application is still pending. You can apply for Refugee Travel Document only after your asylum application is granted. However, if there is an emergency situation, you can apply for an Advance Parole Document as an asylum applicant which would allow you to return to the United States. Nevertheless, it is within discretion of the USCIS to grant or deny your application for Advance Parole. I used false information to obtain B-2 tourist visa and applied for asylum after I entered the US. What are my chances? Prior to every asylum interview, the USCIS asylum office obtains from the consulate copies of all your visa applications. The asylum officer will review the forms and information you provided during the consular process and compare it to the information you provided in the asylum application. If there are any inconsistencies or contradictions, the asylum officer during your asylum interview, must ask you questions about your visa application and give you a chance to explain. If the asylum officer is satisfied that you had provided false information in your visa application because you had no other ways to escape the risk of harm or to avoid persecution in your home country, then USCIS will not likely deny your asylum case for this reason. According to the USCIS Asylum Officer’s Manual, the officers are instructed to not deny asylum applications solely based on the false information provided by the applicant during the consulate visa application or for gaining entry into the US. The officer is instructed to ask questions and to determine if the applicant lacks credibility. The key is to make sure to tell the truth when asked about the visa application. If you lied during your visa application, not everything is lost, and you may have an explanation. But if you continue lying at the interview, your asylum application will certainly be denied. In other words, when the officer asks you questions at the interview, you must come clean, give truthful information and honestly answer all questions at the asylum interview. If you truthfully answer all questions at the asylum interview, your previous misrepresentations to the consulate, may be forgiven and become irrelevant. But your misrepresentations at the asylum interview or at the individual hearing will not be forgiven. The logic behind this is that, providing false information to flee the country due a risk of immediate harm, may be understandable. But providing false information to obtain asylum is not justifiable. I applied for asylum, but my family members are still in my country. How do I expedite my asylum case? Are there any exceptions to the one year filing deadline for asylum application? extraordinary circumstances causing the delay. However, when these circumstances exist, you need to file the application within reasonable time given the exception. “Changed circumstances” means new developments which now give rise to the reasonable possibility of persecution in your home country. It may be something you did while you were in the US, after one year deadline had passed, making you a target of possible persecution in your country, and thus, earning you basis for asylum. Or another example – you are a homosexual from a country which recently passed laws making it a crime. “Extraordinary circumstances” usually means circumstances which made your asylum application either “impossible” or “unnecessary” within the one year of your presence in the US. An example of impossible is – you had a serious medical condition precluding you from filing your asylum application within one year of your entry into the US. An example of “unnecessary” is having a valid immigration status in the US and therefore not needing asylum to avoid returning to your home country. Thus, you can apply for asylum even after several years of presence in the US as a student on F-1 status or in any other non-immigrant status, such as H-1B, J-1, etc. It is important to note that, even if you had changed or extraordinary circumstances, you must file for asylum “immediately” after those circumstances arise or stop existing. For example, if you are applying for asylum after one year deadline based on the changed country conditions, you must file the application immediately after those conditions change. Or if you file for asylum after one year deadline because you had a student visa status which you just lost (e.g. because you stopped going to school), then you need to file for asylum as soon as possible after you lose your status. The official term is “reasonable time.” However, the asylum officers interpret it to mean nearly immediately. Typically, a delay of less than 90 days counts as reasonable. But don’t take our word for it. There are multiple cases involving disputes and different interpretations. There is no specific amount of time set as “reasonable”. It dealt with on case-by-case basis. Can I travel outside the United States while my asylum application is pending? We strongly recommend not to travel during your asylum case processing. Even though, there is not an automatic ban, leaving the US while having a pending asylum application may cause denial of your asylum application, delays and other unfavorable consequences. In emergency situations, the applicant may apply for Advance Parole to get an authorization. However, Advance Parole is rarely granted in pending asylum cases and, even if granted, it does not guarantee your return. It will be under discretion of the US Customer and Border Protection (CBP) officials to allow or ban the applicant’s re-entry. I asked for extension of B-2 status, which was denied. I now applied for asylum. How does my application for B-2 extension affect my asylum case? Every application and interaction with the USCIS or DOS creates extra questions in the context of asylum process. One of the tasks of an asylum officer is to verify the applicant’s credibility. One of the ways by which the officer checks the applicant’s credibility is by comparing the asylum application to the applicant’s previous applications and comparing the information provided in the previous forms and visa applications with the information provided in the asylum application and asylum interview. The situation with applying for extension of visitor or tourist status prior to applying for asylum is especially delicate, because, to be eligible for a visitor status, the applicant must demonstrate that he/she has a home country residence to which the applicant intends to return. But, on the other hand, to be eligible for asylum, the applicant must demonstrate that he/she is not willing and cannot return to his/her home country. Thus, an application for extension of B-2 visitor, in most instances, contradicts the asylum application and damages the applicant’s credibility. The applicant’s credibility may be restored, if the applicant proves that his/her intent or grounds for asylum application came up after the B-2 extension. For example, it is possible that the applicant filed for extension or change to B-2 visitor status, hoping that the situation in the applicant’s country would change and the applicant would be able to return during the six months of the requested stay and, when at a later time, the applicant realized that his/her return is impossible or dangerous, the applicant decides to file for asylum. Therefore, in general, applying for any non-immigrant status, such as visitor visa (B-2) or student visa (F-1), while intending to apply for asylum is contradictory and not recommended. Of course, making any misrepresentations or providing false information may be deadly for asylum chances. I was looking for a lawyer who had experience working with similar cases and had a good knowledge. Ismail was a great candidate for this role. He made a personal connection with me and my case and made sure I was informed about the process and steps I had to take as an applicant to make a solid, strong case. Ismail and his team professionally handled all my immigration cases from the beginning to the end. They got me asylum, then green-card and I now became a US citizen! I strongly recommend this firm to anyone who needs excellent immigration lawyer. Short Description: Many people flee their home countries in search of freedom. It is no surprise that the United States of America has become one of the top choices for refugees applying for asylum from their oppressive governments. However, before you can become an asylee in the U.S., you need to formally seek asylum status based on one of the five factors: race, religion, nationality, political opinion, or membership in a particular social group. Attorney Ismail Shahtakhtinski and his team have extensive of experience in providing legal assistance to asylum seekers from all over the world.